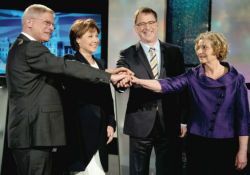 This week, we present a BC Election Special before the polls open on Tuesday, May 14. Are the important issues actually being addressed through organized politics? How will Indigenous rights, access to education and health, government transparency and the climate fare after election day? Music: Class Action Ska (“Rise Up”), Michael Franti (“Nobody Right, Nobody Wrong”), M.I.A. (“The World”), Lee Harvey Osmond(“Cuckoo’s Nest”).